Take a trip to local electronics stores and you will find shelves filled with home automation systems and light switches which can be turned on and off by a smartphone. Some provide a capability to schedule times for lights to turn on or off. But that's the extent of the features they offer. Mechanical timers have been around for decades, and turning on or off a light switch with a smartphone is just trading walking to the light switch to flip it yourself with doing it through your smartphone. In the end all those solutions provide is a different way to trigger a light switch. 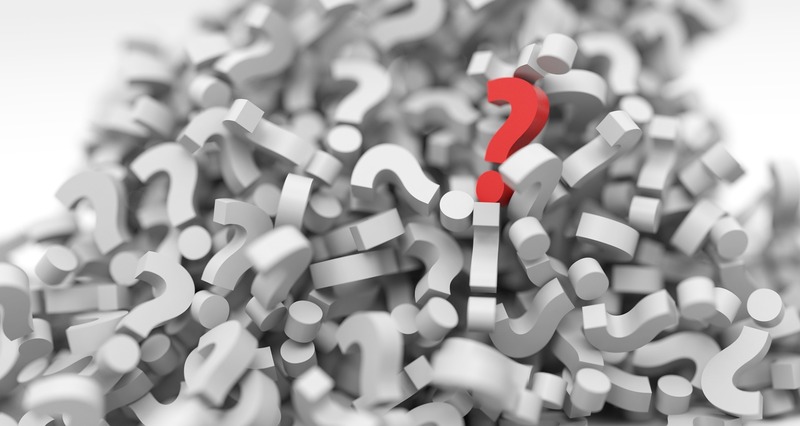 Lack of anything beyond very basic smartphone status and on/off control is one reason many homeowners find themselves disappointed with what many companies are marketing as "home automation". What many people are seeking is a system which provides more advanced, intelligent control and operation of the devices in their home. That describes what I refer to as a smart home, and is why in our articles you'll often see the use of the term smart home system or smart home automation. This series of articles focuses on that more advanced approach. Notice I did not say smart light switches in the title and introduction. Why? Because light switches are not the only way lighting is controlled. Lamps for example plug into electric sockets of which many are not controlled by a switch. So what am I talking about when I say smart lighting controls? Lighting controls are a combination of light switches, electrical outlets, plug-in devices, motion sensors, light sensors, and any other devices connected to control the operation of lighting. When integrated with a smart home automation system, even more devices, such as door sensors and security sensors, can be used to trigger automated lighting changes. 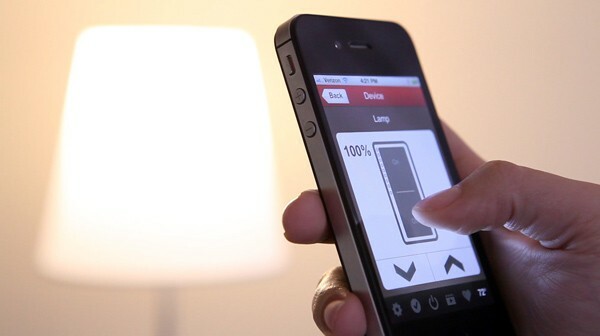 Smart lighting controls open up a whole new world of possibilities. Yes, they allow lighting to be controlled by a smartphone and set schedules for lighting, but they offer far more. Sensors allow changing conditions to control the turning on and off of lighting. 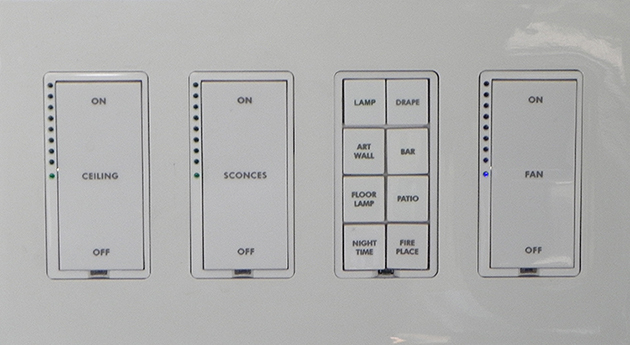 Programmable light switches and keypads enable groups of lights to be controlled together in scenes and to come on at preset levels with customizable ramp rates. Motion sensors are used to turn lighting on when someone walks into a room and turns them off once the room is empty. Light sensors measure the ambient or natural light levels to determine when lamps and other light sources are needed to maintain sufficient light levels in a room. When dark clouds roll in or as the sun rises and sets light sensors are used to trigger artificial lighting to automatically adjust. By connecting lighting controls with other systems such as security and smart home automation, even more capabilities become available. A great safety enhancing example is automatic pathway lighting. Put simply, this ensures when you return home after dark and open a door into your home, the automation system will turn on the lights between that door and a location in the home you typically go to first, such as the kitchen. Using the armed status of a security system, the lighting controls know precisely when you are home and when you are away. At the time you arm the security, the controls will shut off all the lighting in the home. Any alarms will trigger lighting in the affected area to turn on. These features make a home less attractive to criminals and increase the security of the home while you are away. They also improve safety by ensuring you don't walk into a dark home, and energy efficiency by automatically adjusting the lighting in your home when you leave. Smart lighting controls offer an amazing array of new capabilities for a home. Their many features and benefits are why they are the 11th way we're introducing to you to make a home smart. Just like was the case with security systems, the advent of the Internet and smartphones introduced revolutionary changes in this industry. Smart lighting controls are connected to the rest of the worldwide web over Ethernet and wireless cellular connections. This allows smarthphone applications to be configured to connect securely to a home's system, providing it access to status, turning lighting on and off, and to receive notifications to keep you aware of what is going on at home. Here's how it happens. Mobile devices connect to a hub through a home's internet router. That can be a hub specific to just lighting devices or a universal hub which is part of an automation system. The hub creates virtual communications bridges between all the sensors, lamps, lights, and control devices. Communication between the sensors and the actual lights is available across physical wire or wirelessly over communications protocols such as PLC, UPB, Insteon, Z-Wave and ZigBee. Smart lighting controls can also be connected with automation devices or smart home systems. Homeowners seeking more robust automation capabilities can connect their lighting controls to smart home hubs which are compatible. You'll save time and alleviate worry by upgrading your lighting to smart lighting controls and enhance them further by connecting them to a smart home system. Sensors do much of the work for you. Turning lights on and off as you leave and enter rooms, adjusting lighting automatically as natural light levels change. Simply life by triggering an away state for the home and turning off all the lighting in a home with a single button press. Upon return a pathway can be lit and all you had to do was press a single button. Eliminate potential hazards and improve safety around the home by ensuring lights turn on automatically. You'll never walk into a dark room or down a dim hallway again. No more tripping over objects in the dark or searching for light switches you can't see. Many thefts are crimes of opportunity. Thieves are looking for homes they can easily access and quickly grab valuable items from with little risk. An effective way to deter them from your home is by making it a less attractive target to criminals. Programmed lighting will ensure outdoor lighting is always on when it's dark and off during the day. Connecting with a security system makes it possible to schedule adjustments to lighting. This simulates presence while you are away. No one will be able to tell that it's a system controlling the devices around the home and not you. To potential intruders it'll look like you are home even when you are not. Each passing year people's lives get busier and busier. With busier lifestyles come distractions which lead to lights getting left on when we leave. Homes are often left unoccupied for large periods of the day now too. Whether you realize it or not, that's adds up to a lot of wasted energy. By connecting security with automation or lighting controls the systems can do the work for you, making it convenient to save energy. The home will still be well lit and you will have saved some serious money too. This is because features that improve a home's energy efficient and increase functionality are desirable. Smart lighting controls provide both, making your home more attractive and thus valuable when you sell it. Check out our pages dedicated to smart lighting systems and smart home automation, or contact us to learn more.